Charlotte's Library: Texting the Underworld, by Ellen Booraem--review, interview, and giveaway! 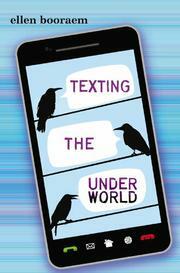 Texting the Underworld, by Ellen Booraem--review, interview, and giveaway! Texting the Underworld, by Ellen Booraem (Dial, Middle Grade, Aug. 15, 2013), deserves the star it got from Kirkus--this is a smart, funny, fantasy, set primarily in the real world, but with a most diverting excursion to the Underworld! It's the story of what happens when a (relatively) young and inexperienced Banshee, Ashling (who once was an Irish girl from the Dark Ages), shows up at the Boston bedroom of a somewhat timorous 12 year old Conor. The arrival of a Banshee means that someone is going to die...a frightening thing for anyone, but for Conor, to whom the world already seems dangerous and difficult, it's especially distressing! And to complicate matters further, Ashling is in no hurry to scream and leave; no, she wants to stick around in 21st century Boston, as a sort of supernatural exchange student, quite visible, quite audible, and quite difficult to explain to friends and family and the school principal. Ashling doesn't particularly want to be a harbinger of death, and Conor most emphatically doesn't want anyone in his family to die, so the two of them (with help from Conor's grandfather and his little sister) hatch a plan. They'll visit the Underworld from whence Ashling was sent, and try to sort things out there....But the Underworld is a twisty and dangerous place, more so even than middle school, and Conor, deeply reluctant even in real life to visit places that aren't mapped, has to find the bravery and determination to face the supernatural challenge of lifetime. The story zips along zippingly, the premise and its various ramifications are fascinating and fun (and even chuckle out loud funny at times), and there's lots of engrossing detail in both the characterization and mythological mayhem! Added to this is a thought-provoking subtext about living life in the face of death that gave it depth, and the author doesn't shy from delivering an appropriatly powerful emotional punch at the end. In short, I liked it lots, would recommend it to both kids and MG SFF reading grownups, and was very happy to have the chance to ask Ellen questions about it! I adore the title. Was it there from the beginning as part of your whole conception of the story, or did it come to you at some later point in a flash of inspiration? I didn’t realize how big a role texting would play until I was well into the story, so the title was more of a last-minute endeavor. And I can’t take credit for it, except that I knew I wanted to combine the mundane with the otherworldly. (At one point I wanted to call it Death & Jelly Beans.) I emailed ideas back and forth with my editor, Kathy Dawson—we had lists and lists and LISTS of possible word combinations—and she’s the one who came up with the winning combination. Conor is a scaredy cat, and somewhat neurotic—not your typical hero (which, of course, is the point—this lets him have a character arc). I found that he teetered just on the brink of being too unheroic at the beginning of the book, and felt you walked a fine line between making him realistically an anti-hero and making him so much so that he becomes unsympathetic. How did you approach this conundrum? Was this something that caused difficulties in the writing of the book? It’s always a problem making sure your characters are realistically flawed and yet likeable. Fortunately, fearfulness is a more likeable trait than obnoxiousness, which was the problem I had to overcome with Conor’s predecessor, Mellie in SMALL PERSONS WITH WINGS. Being afraid of things is such a familiar feeling to all of us that we usually can empathize with it. Also, most of Conor’s fears are also mine, so I definitely was on his side when I was writing him! There are so many zestily entertaining aspects of the book. I especially loved Nergal (one of the denizens of the Underworld--a Babylonian god of death). Was there any part or character who gave you special enjoyment? I’m fond of Nergal, too, and I was so glad when he showed up—he’s a nice, sensible guy, compared to most of the others who help run the Underworld. I like that he’s eager for knowledge and not content with the status quo the way so many in the Underworld are. I came up with him after I realized that my afterlife could not be just Celtic—I mean, the Irish aren’t the only ones who die, are they? So I started looking into death deities from other cultures, and there was Nergal, the Babylonian Lord of the Dead. He’s half lion, and for some reason in my mind that meant dignity and kindness. I enjoyed writing the Underworld scenes in general. Another favorite character was the Cailleach, the unpleasant, black-robed portal guard, who is based on a Scottish/Irish goddess of winter but actually turned out as a weird combination of dementor, Ghost of Christmas Future, and every ill-tempered old lady I’ve ever met. How did you come to write middle grade, as opposed to YA or adult, books? I'm wondering, for instance, if you assayed attempts at those older type books and found they just didn't work for you, or if you always knew you wanted to write MG. In my twenties I concentrated on short stories for adults (none of which ever got published, thank heavens). I started writing for younger readers because of characters my partner, Rob Shillady, a painter, had developed on a whim in art school. He put Medford (his alter-ego) and his sidekick the Goatman in paintings he did for friends, and I decided in my mid-30s to write a picture book based on them. It stopped being a picture book almost immediately, and over the next 20 years years (15 of them spent in a desk drawer) it finally turned into THE UNNAMEABLES. I don’t have a specific age group in mind when I start books—they turn into middle grade all by themselves. The voice and the themes that resonate most with me apparently lend themselves to that “tween” age, when we’re first struggling with the issues of who we are and where we fit in the world. I am sitting here trying to think of a comparable book to T. the U.--one that has a contemporary setting, and an ordinary hero (ie, not the son of a god), and one in which the stakes are personal, or at least familial, but which has fully flowering mythological/fantasy mayhem. My mind is blank. Can you think of any? The ones that first come to mind are some books by Diana Wynne Jones, whose work I just love. Many of her heroes are of the Harry Potter variety—normal kids who discover they have supernatural powers—but she also has some protagonists who are just regular kids in a fix of some kind. EIGHT DAYS OF LUKE’s David Allard, for example, is dealing with unpleasant relatives as well as a bunch of Norse gods, and the children in THE OGRE DOWNSTAIRS are contending with a new stepfather and the effects of a magical chemistry set. But you’re right—it’s far more common that the hero in a “domestic” fantasy like mine turns out to be supernatural in some way. Easy one next--what were your favorite books as a child? Were you any that you feel have exerted an particular influence over your writing? To my constant surprise and chagrin, no one’s ever heard of the formative book of my childhood. It’s THE DAUGHTERS OF THE STARS, published in 1939 in England by an American author, Mary Crary. It ran afoul of World War II, and was rushed to publication before the country ran out of paper and ink. As a result, it only has two of a planned set of Edmund Dulac illustrations, which are utterly gorgeous, of course. My copy was a ninth birthday present from an elderly lady in my neighborhood (definitely not one of the models for the Cailleach). The story is about the bureaucracy that runs the natural world, meaning the stars, the wind, the rain, the oceans, and so forth. Astrella, the younger Daughter of the Stars, is named Luminary of Two Continents and has to transfer from one post to the other for a time. She takes her young daughter, Perdita, on a hazardous journey across the heavens. In the second half of the book, Perdita has adventures of her own. In a foreword, the author complains that she’s sick of reading stories in which the mother is dead, so she created one in which the mother is the only parent in evidence. The heavenly bureaucracy, moreover, is pretty much run by women, usually in their own right but also as the power behind the throne. Astrella and Perdita are perfectly capable of taking care of themselves with no knight in shining armor coming to their rescue. I loved all that, and as well as Crary’s sense of humor. Her book has been important to me both personally and professionally. I realized after the fact that my concept of a bunch of bureaucrats running the Underworld probably owed something to THE DAUGHTERS OF THE STARS. (Me: I shall add it to my Christmas list! It sounds great, and I love Dulac). And finally, another easy one---what are you working on now? I have two middle grade books and one for younger kids in various stages of development—and the one farthest along might never see the light of day so I probably shouldn’t talk about it. Suffice it to say that I’m always working on something! Thanks for the interview, Charlotte—this was fun! Thank you, Ellen, for writing both the book and your answers to my questions! Penguin is offering two copies of Texting the Underworld to two winners (US only); please leave a comment to be entered! Ends next Wednesday (August 14) at midnight. And if you want even more, Ellen has shared the scene in which Conor and Ashling meet for the first time here at Scene 13ers! The next stop on Ellen’s blog tour for TEXTING THE UNDERWORLD is YA Books Central. See you there! Terrific interview! Thanks for sharing some of the 'inside story' behind TEXTING THE UNDERWORLD - what a unique book! I'd love to win a copy! Great interview. This book caught my eye because of the title and it sounds like a fun book for a MG reader like the one I have in mind for it. I looooved Small Persons - just recommended it to a mom yesterday in fact (-:) I've been waiting eagerly for months for Texting and it's on the preorder list at the library! Yep, another book to add to my list to read. If only I did not have to work, I could read everything I have ever wanted to read. Would love to win this one. Such a fun interview! I'd really love to read this - I'm wishing I didn't feel ineligible for the giveaway due to having won from you this year already. Great interview! This book (and the OOP one) both sound awesome. This one sounds interesting! I liked her other book also. Ahhh a combination of mythologies!! This makes me so excited! I went through a phase where I read about all the mythological collections I could get my hands on, particularly Greek, Celtic, and Egyptian, so this sounds AWESOME. Great interview! This book sounds like a great book to read. I will definitely buy this book! I love when authors capture the moments of the times they are living in. Although today texting is all the rage, kids twenty years from now will need to know this. I want to read this one...really caught my attention. Thanks for the nice comments, everyone. And thanks again, Charlotte, for the evocative questions! Sounds great, please enter me in the giveaway! I'm so happy TEXTING THE UNDERWORLD is finally (almost) out! I'm a long-time Booraem fan, and this story sounds truly wonderful. Thanks for the interview, Ellen and Charlotte! I can't wait to read this book! It seems like it will be a great read! What a fun book! The title definitely got my attention. Thanks for linking up to the Kid Lit Blog Hop! Great interview! Love the sound of this one :) Thanks for the amazing giveaway!